Approx. 15 Minutes to S.F. NOW SELLING! Introducing Enclave | Corte Madera built by Ryder Homes. 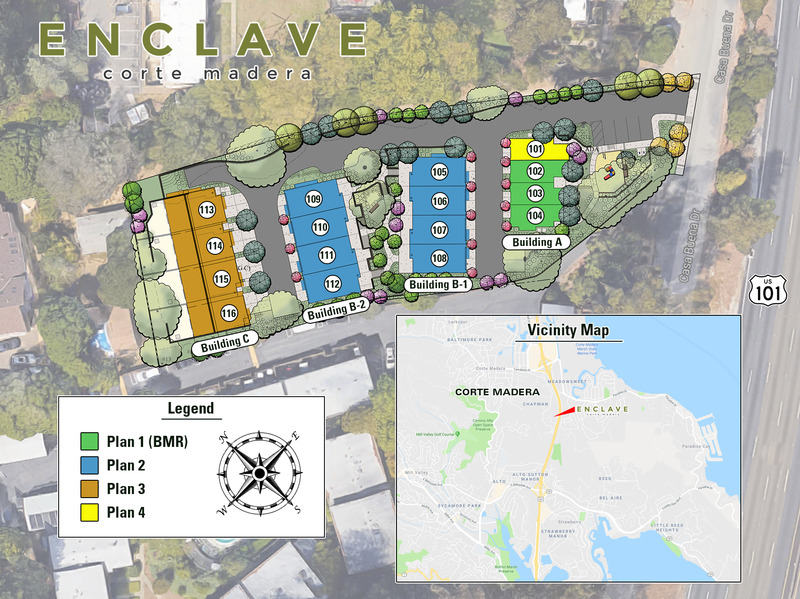 An exclusive new community of only sixteen luxury townhomes located just fifteen minutes outside of San Francisco and in one of the most sought after Marin County zip codes. Enclave features three different 3-4 bedroom floor plans ranging in size from 1,359 - 2,087 square feet and either a 1 or 2-car attached garage. Each townhome is "turn-key" and comes complete with high-end finishes including designer LVP hardwood flooring, Quartz countertops with full backsplash, 12x24 Emser tile in the bathrooms, zero threshold master shower, 3x6 subway tile shower surrounds at secondary bathrooms, Moen faucets, sound-reducing windows, GE Cafe appliances and a modern linear 42" Montigo gas fireplace. GET IN TOUCH TODAY TO SCHEDULE A PRIVATE TOUR!